Published: May 1, 2016 at 03:12 p.m. 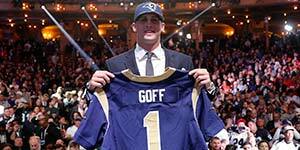 Updated: May 11, 2016 at 05:21 p.m.
After the top two picks in Thursday night's draft, the Ravens knew the Chargers would select Joey Bosa and the Cowboys were listening to offers for the No. 4 overall pick. "San Diego is taking Bosa," assistant general manager Eric DeCosta announced in Baltimore's war room. "Bosa was on the phone for two hours on Tuesday night with (Chargers Owner) Dean Spanos." At that point, per vice president of public and community relations Kevin Byrne, Ravens general manager Ozzie Newsome called the Cowboys with a proposal for the fourth pick. When Dallas countered, Newsome replied, "No, we won't go there." Who was the Ravens' target? Newsome confirmed a Baltimore Sun report that it was Florida State cornerback Jalen Ramsey, who went one pick later to the Jaguars. "We tried to trade up for Jalen," Newsome said, via the Baltimore Sun. "You know that." Under Newsome, the Ravens' draft philosophy has been to target the best available player. Ramsey was obviously high on their board. Unable to land Ramsey, Newsome ended up staying put and selecting Notre Dame left tackle Ronnie Stanley. "We value our board," Newsome told reporters later in the evening, "and he was the highest player on our board when we picked." Higher even than Laremy Tunsil, who slid after an unauthorized video -- showing the Ole Miss tackle wearing a gas mask and smoking through a bong -- was posted to his Twitter account. Newsome promptly brought the video to the attention of owner Steve Bisciotti, as the two men worked under a large draft-room sign that reads, "The best predictor of future behavior is past behavior." Asked if the video was a factor in Baltimore's decision, Newsome responded, "That's always a part anytime you get information. Our scouts get a lot of information. When things happen, a lot of times we're not surprised." Ultimately, the Ravens stayed true to a board that had Stanley ranked among the top four players, per ESPN's Jamison Hensley. "I want to place my red star on one of the top players on our board," pro personnel director Vincent Newsome told Byrne after the draft. "I look for the cleanest player among the best of the best. Ronnie is that. He has all the skills and physical attributes to be an outstanding NFL player. He kept improving at Notre Dame. He's a good person, and there are no blemishes in his history. He's what we want a Raven to be. That's why he earned my star."